What happens when a little girl moves into a new house and discovers a tiny door? One day she manages to open it . 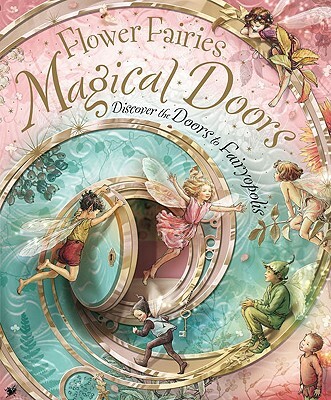 . . and her world is forever changed when she gets her fi rst peek at the homes and the magical world of the Flower Fairies. As she starts to explore her neighborhood with a friend, they discover that there are more doors—all leading to the most secret of fairy places. Filled with gorgeous paper ephemera, pop-ups and special interactive features on every spread, this beautiful novelty book leads the reader to eight fairy doors to open and investigate. Each door has its own individual shape, color and characteristics— some are decorated, others have little signs or notices, a set of footprints leading up to it, or magical fairy glitter at the doorstep. As the book progresses, more of the fairies and their world are revealed, culminating in an exciting and secret fairy nighttime ball. For full text of warning label click here.